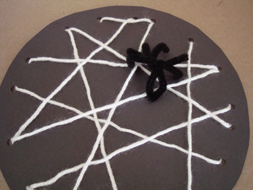 Spider Web Lacing is an easy way to make a fun spider web decoration for Halloween! Not to mention that lacing is a great way to practice those fine motor skills! This is a great Halloween craft for a group since a ball of yarn or string can make many spider webs! 1. Cut a circle out of black construction paper, use a plate to trace around. 2. Cut a long piece of yarn or string, the longer your string the more intricate your web will be. Tape one end of the yarn close to one of the holes, and wrap a piece of tape around the other end (to make it easier for little ones to lace). 3. Thread the yarn in and out of the holes, in any direction you choose! When you are done, tape the end close to a hole. If you want to add more to your web just tape on another piece of yarn and continue threading. 4. To make the spider just cut each pipe cleaner in half (so you have four pieces), bundle them and twist them in the middle so your spider has eight legs. You can wrap one of the pipe cleaner legs around the yarn to make it stay on the web.